The seventh annual IRRCi deadline for submissions draws near. The Investor Responsibility Research Center Institute (IRRCi) is accepting submissions for its seventh annual competition for research that examines the interaction between the real economy and investment theory. Practitioners and academics are invited to submit research papers by Friday, October 19, 2018, for consideration by a blue-ribbon panel of judges with deep finance and investment experience. 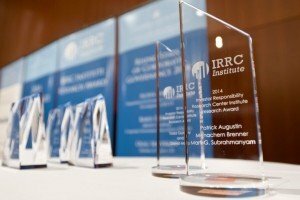 Two research papers – one academic and one practitioner – each will receive the seventh annual IRRCi 2018 Research Award along with a $10,000 award. Winners will be announced in December 2018. Equity Vesting and Investment, is co-authored by Alex Edmans, London Business School; Vivian W. Fang, Carlson School of Management at the University of Minnesota; and Katharina A.Lewellen, Tuck School of Business at Dartmouth. This paper studies the link between real investment decisions and CEO’s short-term stock price concerns. It finds that vesting equity induces CEOs to reduce investments in long-term projects and to take actions that increase short-term stock price. More broadly, it shows that that the structure of CEO compensation has a causal effect on real-world decisions. The second winning paper, The Long-Term Consequences of Short-Term Incentives, is also co-authored by Edmans and Fang, together with Allen H. Huang of the Hong Kong University of Science and Technology. This paper studies two corporate actions that allow accurate measurement of the long-term consequences of short-term incentives – stock repurchases and mergers and acquisitions (M&A). The research shows that the impending vesting of equity may lead CEOs to take myopic actions that boost the short-term stock price at the expense of long-term value. An increase in vesting equity is associated with a greater frequency of stock repurchases and M&A announcements, and both corporate events were associated with higher short-term returns and lower long-term returns. James Hawley, Professor Emeritus of Economics and Senior Research Fellow, Elfenworks Center for Fiduciary Capitalism at St. Mary’s College and Head of Applied Research, TruValue Labs. Biographies of the judges are available here. Award submissions are accepted online here. Submissions may be an original work created specifically for the IRRCi Research Award, or relevant unpublished papers, or papers that have been published after July 1, 2017. “This award is unique because it focuses on both academic and business research, and links capital markets and investing back to the real economy,” said Jon Lukomnik, IRRCi executive director. As noted on the IRRCi web site, Modern Portfolio Theory (MPT) has dominated investment theory for more than a half century. MPT focuses on security selection, portfolio construction, and other financial issues rather than the intersection of the real economy and investing. Simultaneously, the growing importance of the private sector relative to the public sector in the real economy has increased scrutiny of private sector behavior and economic activity. The IRRCi Research Award encourages new research that analyzes how investments interact with real world economic activity. More information regarding the award process, submission guidelines and calendar is available here, along with the award submission form and Frequently Asked Questions. Information on past winners is available here. More information about the award is available here. Read the full body of IRRCi research here. IRRCi has a new home! The Investor Responsibility Research Center Institute (IRRCi) announced that it has selected the John L. Weinberg Center for Corporate Governance (Weinberg Center) at the University of Delaware as its successor organization. The Weinberg Center will receive a grant from IRRCi in excess of $1 million as part of the successor transition. With these funds, the Weinberg Center will materially expand its environmental, social, corporate governance and capital market research, and also maintain the full IRRCi research library so that more than 75 research reports remain publicly available at no cost. The Weinberg Center also will continue to fund and manage the annual IRRCi Investor Research Award that recognizes outstanding practitioner and academic research. The Investor Responsibility Research Center Institute is a nonprofit research organization that funds academic and practitioner research enabling investors, policymakers, and other stakeholders to make data-driven decisions. IRRCi research covers a wide range of topics of interest to investors, is objective, unbiased, and disseminated widely.